This is an advertisement for an evening's entertainment at the Spa Concert Hall in Harrogate. During the 19th century, Harrogate was a popular resort where people would ‘take the waters’ for its healthy properties and walk through the relaxing and beautiful ornamental gardens whilst being entertained by bands and singers. As more wealthy consumers began to visit the town, a higher calibre of musician was needed, and performers were sought after from London and the continent. 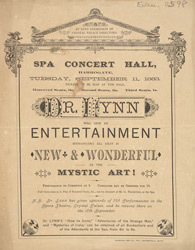 Magicians and conjurers were also popular, bringing gasps of astonishment and cries of delight from the crowds.